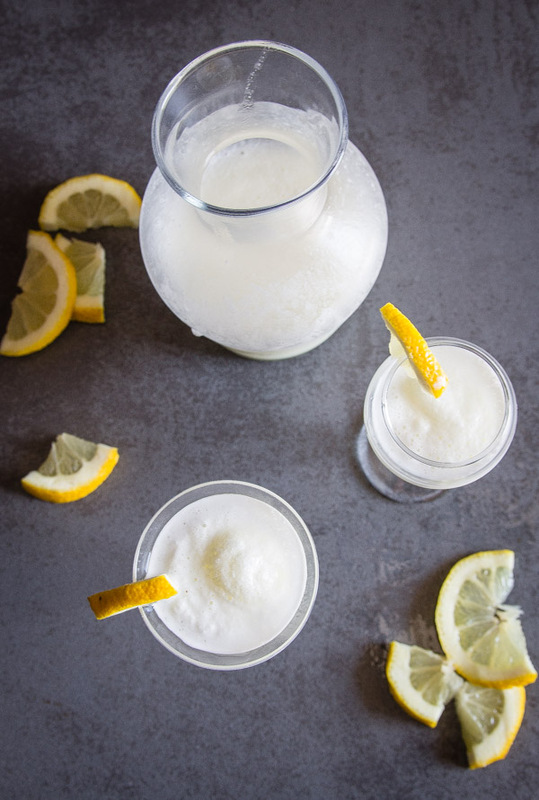 Lemon Sorbet Drink, a traditional Italian Drink to help “clean the Palate” or “help with Digestion” or just the Perfect Sipping Drink. 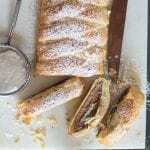 Creamy, Cold and perfectly lemony. 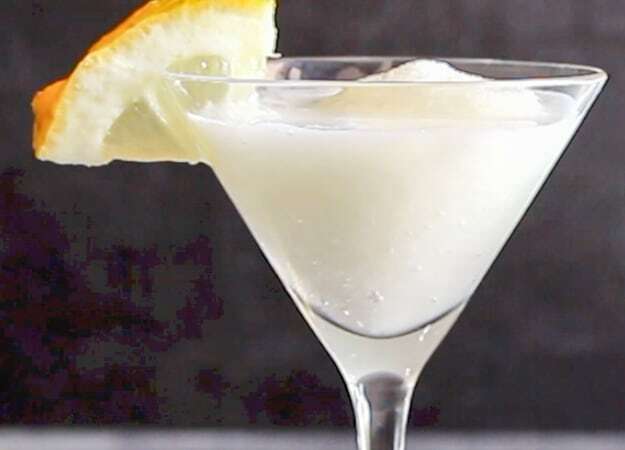 This Lemon Sorbet Drink is not to be confused with a Sgroppino, which originated in Venice and is Sorbet mixed with Vodka and Proscecco. Made as an alcohol free Drink, although you can add a little Vodka if you want. It is tradionally served between dishes to help clean your Palate or help with digestion. But in my opinion also the perfect sipping drink. I have to tell you, my youngest daughter and I have been obsessed with this forever. Whenever there was a family get together in a restaurant, our first question was “will there be that amazing Sorbet Drink”? There usually was because eh this is Italy and it’s a tradition. Lucky for us there were also a few people in the group who didn’t like lemons, my eldest daughter included, I know What?! So we would obviously put our claim in first for their drink, before anyone else did! 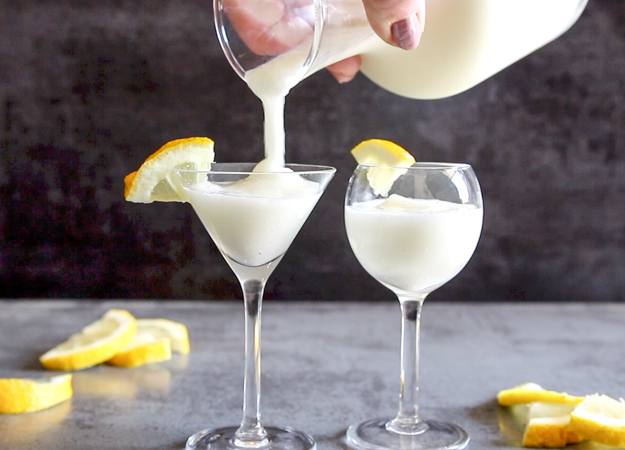 So when I finally came across a Recipe for Italian Lemon Sorbet Drink (and yes I have searched and searched), that sounded like the real thing, I knew I had to make it. 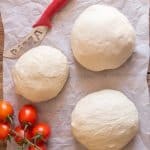 It does call for egg whites but now pasteurized egg whites are easy to be found so don’t let that stop you. We were so excited about this Drink, we could hardly wait for the freezing period. But we did, it was so good, tasted exactly as we had it in the restaurant and yes we did share. Salute! 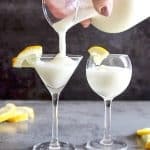 Italian Lemon Sorbet Drink, a delicious traditional Italian digestive middle of dinner drink. Creamy Lemony and so good. In a large bowl beat egg whites and powdered sugar until stiff, fold in a little at a time the lemon juice, syrup and vodka if using. Pour into a plastic or freezer safe bowl and freeze for at least 8 hours, stirring 2-3 times to combine. Before serving blend in a blender and serve immediately. 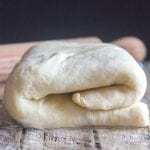 Pour any left overs in a bottle, keep in freezer and shake well before serving. Enjoy! Hi Manuella, the syrup is the sugar and water mixture that you boiled (the first part of the recipe). Hope this helps. 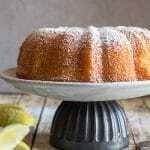 I simply love anything lemony!! I think lemon and basil are just about my favorite aromas, well, rosemary too, and you can add in lavender. I guess I like the fresh natural scents. But the sorbetto sounds heavenly — I’ll have to make some up when we get home. How is pre-summer treating you so far?? Thanks Marisa, me too I love anything Lemon, especially in the summer. Let me know what you think. Have a great weekend.